&bull; Brand: Sukkhi &bull; Product Type: Rakhi &bull; SKU: 103GP_113GP_RAKHI850_Y16_HD &bull; Colour: White and Golden &bull; Material: Alloy &bull; Plating: Gold Plated &bull; Stone Used: Cubic Zirconia &bull; Design: CAD/CAM &bull; Dimension: L: 2 cm||B: 1 cm||Weight: 20 gms &bull; Description: Rakhi - A Touch of Modernity into the Traditional and Sacred Thread of Rakhi The Rakhi thread is introduced for the celebration of the festival of Rakhi that is also known as ‘Raksha Bandhan’. It is the sacred thread that every sister ties on the wrist of their brother, while praying to God for their well being. But now with many changes have occurred into their availability in the markets and people are showing more preferences for the latest variety. 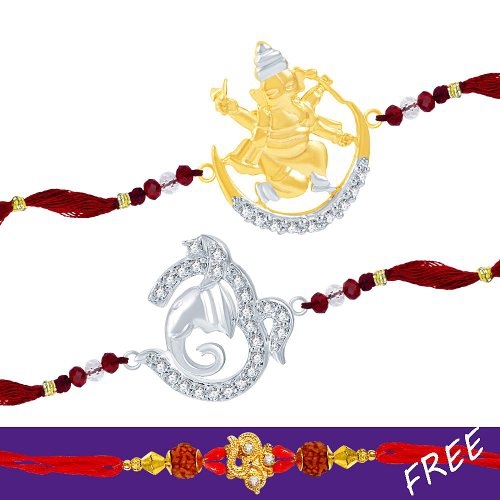 So keeping in tune to the latest trend, we have come up with an excellent variety of online CZ Rakhi that is perfect for make your brother feel special. Rakhi is the festival of expressing the feelings of love. Thus what can be better than expressing it your loving brother by bringing a CZ Rakhi for him this year. 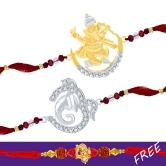 In our range of Rakhi, there is a vast choice for selecting the best one for your brother. The choice is in terms of designs, patterns, materials used and colors. So now depending on your suitability, you can make a choice for the best CZ Rakhi gift to impress your brother. In fact, CZ Rakhis would be the one that your brother would also love to wear long after the celebration day of Rakhi. So, when thinking of the best Rakhi for your brother, then just log on to our vast range of Rakhis and select the best Rakhi to buy online. You can also send Rakhis to your loving brother as a token of your love, when you found it difficult to be there with him. &bull; Care label: Avoid of contact with water and organic chemicals i.e. perfume sprays. Avoid using velvet boxes, and pack them in airtight boxes. After use , wipe the jewellery with soft cotton cloth. &bull; Note: The image has been enlarge for better viewing. &bull; Disclaimer: Product colour may slightly very due to photographic lighting source or your monitor settings.